If you go to the Alps to enjoy freeriding and freestyling, the Arlberg will make your dreams come true. The ski region stands on top of the best ski areas with fantastic free ride possibilities. More than 200 km of high-alpine powder runs, the possibility to go heli skiing and snow guarantee from the end of November to the end of April turn the ski region on the Arlberg into a stronghold for the international freeride community. Looking for a different kind of thrill? Then come to Lech Snowpark. Untouched snow fields and glittering powder at your feet: like hardly any other place, the Arlberg offers a multitude of free ride spots off the regular pistes. More than 200 km of wonderful deep powder snow runs and snow guarantee in heights of up to 2,000 m speak a clear language. Lech Zürs can boast a special award: In the snow-online.de ski resorts checklist 2008/2009, the mundane ski destination was voted No. 1 in the category “Best Freeride Opportunities”. These conditions also produced the world-famous freeriding professional Lorraine Huber who can often be found in her home resort and also organises the yearly Women’s Freeride Camp. Ski down from peaks where no cable car goes up to, endless, dreamlike powder ski runs – this idea makes the hearts of experienced off piste skiers beat faster. Lech Zürs belongs to one of the few ski regions in the Alps where you can still go heli skiing. Under the guidelines of nature conservation, this pleasure can only be experienced accompanied by a qualified ski guide, in selected spots and only during the week. There are two target peaks on the Arlberg: the Mehlsack (Zuger Schafberg), which is reserved for experienced and good skiers and offers dream runs either towards Älpele or the Spullersee Lake. For the Schneetal (2,450 m), a medium skiing level is sufficient, you start your ride below the Orgelscharte. You can make reservations for heli skiing at the local ski schools, please note though that flights are dependent on the snow conditions, the weather and availability of ski guides. If you plan to go on a heliskiing trip, please get the forecast a few days before you arrive at the Lech Lodge, or ask at the ski schools on site. 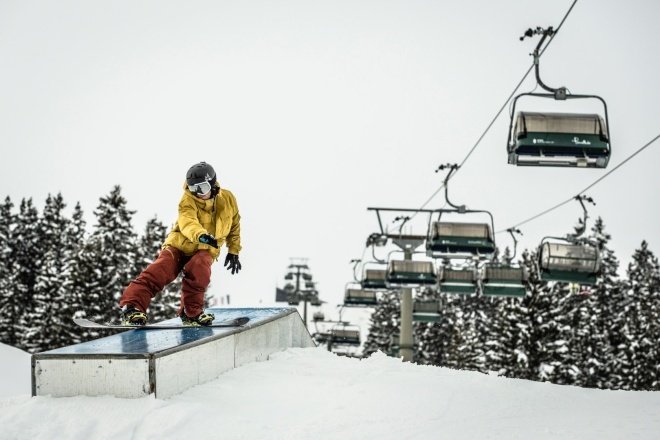 The Lech Snowpark is the meeting point for all those who like to do tricks on their boards. No matter if you are a beginner, advanced or pro, for every level there is the right area. In an area of 3.6 hectares, there are 17 obstacles, divided into a Fun Run/Easy Run, Rail-Line and Pro-Line. The snowpark is located right in the middle of the ski region Lech Zürs on the Schlegelkopf and below the ski lift. So when you go up, you already get a good overview of the park and can observe your colleagues in action.